When I undertook a PhD project on sailors back in 1993, work on impressment per se was scarce. One of the more memorable works had been published in 1913. The secondary literature that is available now amounts to an Aladdin’s Cave of riches compared to what I had to work with two decades ago. 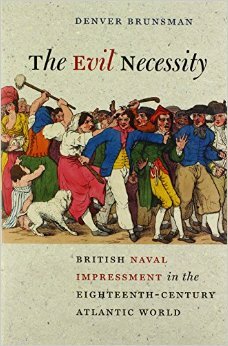 The books I’ll discuss in today’s post (part one of two) are Nicholas Rogers’ The Press Gang: Naval Impressment and its Opponents in Georgian Britain and Denver Brunsman, The Evil Necessity: British Naval Impressment in the Eighteenth-Century Atlantic World. Rogers and Brunsman address the press gang in terms of the Royal Navy’s needs and policies and both make use of Admiralty archives, but they also set it firmly in contexts that include politics, law, society, culture, and philosophy; they consider race, class, and gender in some depth; they draw upon parish records, municipal records, poor law records, newspaper accounts, first-person accounts from various perspectives, lawsuits, Home Office archives, as well as Colonial Office archives. Without, of course, doing justice to either of these books in this short format, I have pulled out particularly interesting material under four subheadings: The Press Gang and Civic Life; Women and Impressment; Masculinity and Impressment; and Wider Resonances. What we can see here are the ways that impressment is becoming integrated into mainstream history. I use that term advisedly; it’s the kind of history you see practised at the largest conferences, in the profession’s flagship journals, and the sort of perspective that prevails in the magisterial “big picture” textbooks that cover long time periods and synthesize work from a multitude of subfields. On a more intellectually substantive level, some communities believed that the burden of impressment fell disproportionately upon them, or questioned the need for a mobilization. Boston, Massachusetts occupied a strategic position near French Canada for much of the eighteenth century and endured especially frequent visits from the Royal Navy. The imperial benefits were clear, but the local costs seemed exorbitantly high; Boston merchants argued that even the fear of press gangs acted to suppress their coastal trade and harmed their economy. In cases where foreign invasion seemed plausible or imminent, cooperation might be forthcoming, but Rogers offers a very interesting statistic that in Britain, riots against the press gang were sharply higher during the “phony war” mobilization over the Falkland Islands crisis. This suggests a more sophisticated public than we sometimes imagine. Of course, sometimes interference with impressment took more self-serving forms. Lieutenant William Dillon came to Hull to press men in 1803. He remarked that in his six week stay, he “never dined alone” and that the merchants who feted him, and even supplied him with women, did so in the hope that he would take sailors—just not ones from their particular ships. One way to think about an incident of resistance or interference is in terms of the net outcome. A few towns (Rogers mentions Whitby and Poole) established themselves as no-go areas for the gang, and Brunsman argues that in New England, riots forced impressment offshore for a time. Yet expecting decisive consequences like these may set an unrealistically high standard for crowd action, and miss the point in other ways. In certain communities, a custom emerged of parading trophies from the gang, even the captured press tenders themselves, through the streets. In 1793, the inhabitants of Greenock hauled a tender to the middle of the public square and burnt it there. 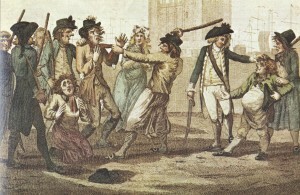 In South Shields, they captured the press gang and force-marched them down the middle of the street, with their jackets turned inside out, under a banner that read “Liberty for Ever.” It is instructive that these examples come from the same communities, and the same decade, also mentioned in the preceding paragraph. Mary Wollstonecraft argued that impressment was a women’s issue. One of the Navy’s attempts at enlightened and sensitive impressment had unintended negative consequences for women. To reduce uncertainty for merchants, vessels were stopped upon their return, not on their way out, and they would be left with enough of a crew to get the ship into harbor. Thus the ports got their cargo, the merchants got their profits, and the Navy got their men. This was not such good news for sailors who had just finished (as they thought) a long voyage. On Tyneside in the 1790s, poor relief had to triple because of missing wage-earners taken up by the press gangs. Brunsman coins the term “impressment widow” and remarks on the ethical uncertainties involved with this status. Rogers opens his book with the story of a woman who was driven to crime after she lost her husband to a press gang. The story was popular enough to embellish and be retold in variant forms, but it resonated because it spoke to a familiar issue. Songs such as “Oh the Weary Cutters” with its eerie, dirge-like tune formed a sort of subgenre of their own, and are still performed today; here is a “press gang medley” of songs written from a woman’s point of view. The standard answer to “why bother to resist?” has been resentment over the lost wages that sailors could have earned elsewhere. To some, impressment seemed like theft. Merchants paid high wages in wartime. Wartime also meant a chance to serve on privateers; this promised excitement and esprit de corps, but with more freedom than the Navy could offer, and possibly more money. As I discussed above, we should also remember sailors like William Skill, eager to reunite with loved ones. Yet there is room for a more wide-ranging consideration of masculinity here. Brunsman draws attention to different aspects of what he calls “the impressment paradox.” For example, sailors who led the press gang on a merry chase often fought valiantly in the Navy afterwards. He argues that we need to take a more limber and capacious approach to agency here, and develop a better ear for how “naval service returned to impressed seamen some of what their capture had taken away.”  He even develops a concept of “delayed patriotism” to address this. There are difficulties, though, in trying to infer a motive when all we have to go on—in most cases—is the behavior itself. It’s possible that Brunsman is overthinking this. The sailors sought by the press gang were young men in top physical condition with ample experience in a line of work that put a premium on agility. If they thought it would be fun to outrun the gang (out the window! down the alley! over the rooftops! ), is that so surprising? Port towns supplied a large, admiring audience, an audience that might include family members young and old, and certainly an audience that would include many women. The evidence is clear that sailors loved to pull these stunts. The evidence is also clear that they loved to talk about them later. Captain Marryat recorded: “The conversation among the crew… generally turns upon the ‘hair-breadth ‘scapes,’ the difficulties and dangers they have encountered, the means they have employed to desert, &c.”  This suggests a friendly contest for whose exploits were the most daring, but also the risk of challenges to the spinners of tall tales. Feats of derring-do in port—like escaping a press gang or fighting one off—carried with them the advantage of many witnesses to corroborate the story for years afterwards. Possibly the impressment paradox doesn’t seem so odd when viewed through a masculinity lens. That does leave us with some men who ran and/or fought against the press gang; then served with distinction in battle; then deserted. From a certain point of view, those lads would have three things to boast about later. 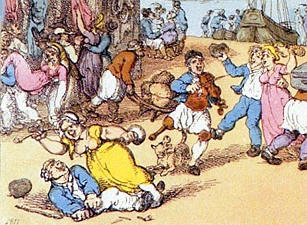 Stories about impressment circulated even more widely than the press gangs themselves. 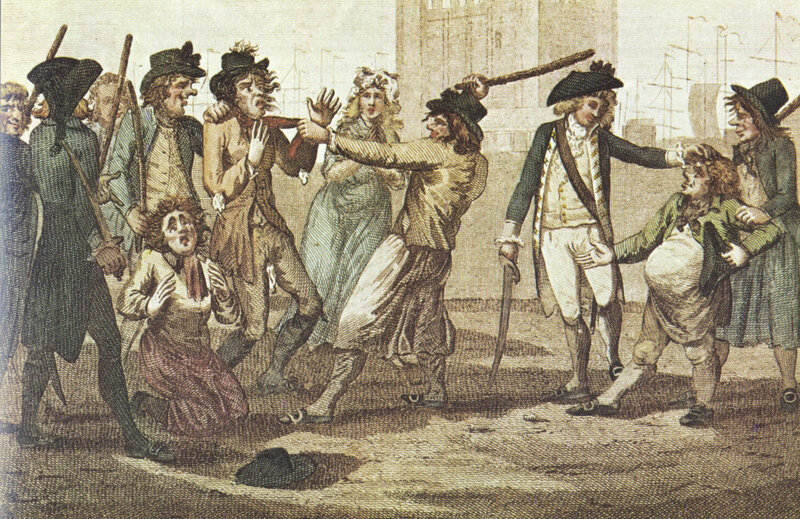 There is now an entire book about the press gang in eighteenth-century literature, with separate chapters on the press gang in plays and the press gang in ballads. Brunsman, ever conscious of Atlantic World parallels, offers the fresh suggestion that press gang stories were popular for some of the same reasons as captivity narratives. Of the many ways that we might quantify the impact or relevance of the press gang, the sheer number of publications about it deserves some mention. The philosophical issues at stake here were not small ones. “Liberty,” Brunsman writes, “was the protean ideological glue that helped hold together the British Atlantic world in the eighteenth century.” This may help explain why the troubling moral issues posed by impressment drew attention from King George II upon his accession to the throne, and later from Voltaire, David Hume, Benjamin Franklin, and Tom Paine. The Magna Carta and other constitutional documents were often invoked against impressment, correctly or not. Brunsman notes that impressment was “the most consistent cause of violence against British imperial officers in North America before the American revolutionary era.” The moral evil of conscripting a man to fight against his country and comrades is mentioned in the U.S. Declaration of Independence. 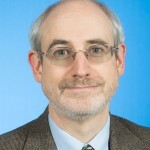 I should mention that Christopher P. Magra is at work on a monograph entitled Poseidon’s Curse: Naval Impressment and the Atlantic Origins of the American Revolution. Those of us who teach—even in passing—about “moral economy” riots, or assign E.P. Thompson’s essay on them, may want to consider adding press gang riots into the conversation. Rogers adds that “about one in four (N=150) impressment affrays ended in a death or a serious injury.”  This also may be something worthy of mention in the classroom, since it differs from the moral economy tradition of mostly nonviolent crowd action. In part two of this discussion of new scholarship, I’ll consider Jeremiah Dancy’s The Myth of the Press Gang. J.R. Hutchinson, The Press Gang Afloat and Ashore (London: E. Nash, 1913). Published, respectively, by (London: Continuum, 2007) and (Charlottesville, VA: University of Virginia Press, 2013). For the Channel Islands, see TNA HO 28/29: 24 March 1803, Admiralty Office to Sir George Shee; 1 April 1803, William Marsden to John King; 13 March 1803, J.A. Wood to Evan Nepean; 5 April 1803, Evan Nepean to Sir George Shee. Brunsman, Evil, 123, 127, 222-3. Rogers, Press, 23-29, 62-63; see also Brunsman, Evil, 234. Isaac Land, “The Humours of Sailortown: Atlantic History Meets Subculture Theory,” in City Limits: Perspectives on the Historical European City, ed. Glenn Clark et al. (Montreal: McGill-Queens University Press, 2010), 325-347, see pages 334-342. Rogers, Press, 56; Brunsman, Evil, 242. Robert Darnton, The Great Cat Massacre and Other Episodes in French Cultural History (New York: Vintage, 1985). Glasgow City Archives, T-ARD 3/9: Greenock Merchants Society minutes, 25 November 1790; the 1794 playbill is reproduced in Hutchinson, Press Gang, facing page 188. David Garrioch, The Making of Revolutionary Paris (Berkeley, CA: University of California Press, 2004). Rogers, Press, 106. 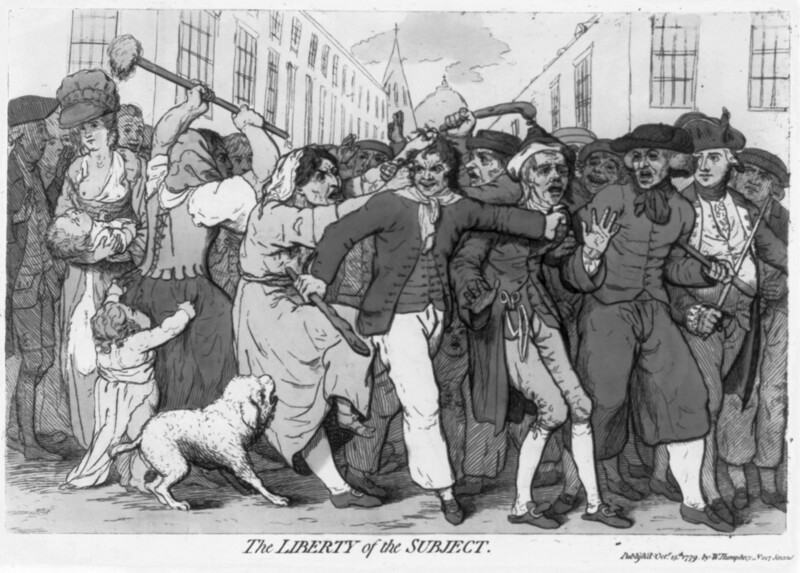 Something similar took place in Boston, Massachusetts in 1768; see Christopher P. Magra, “Anti-Impressment Riots and the Origins of the Age of Revolution,” International Review of Social History 58 (2013) Special Issue, 131-151, see page 146. Brunsman, Evil, 62, 114; in the Caribbean, however, this practice had to be modified out of concern that inbound slave trade vessels, if left with a skeleton crew, might be at risk for an uprising from below decks. Rogers, Press, 41, 47, 51. Brunsman, Evil, 193; Rogers, Press, 32-33, 194. I believe there is new scholarship on this coming down the pike, but see Patricia Y.C. E. Lin, “Extending Her Arms: Military Families and the Transformation of the British State, 1793-1815,” Ph.D. dissertation, University of California, Berkeley, 1997; Margaret R. Hunt, “Women and the Fiscal-Imperial State in Late Seventeenth and Early Eighteenth Centuries,” in Kathleen Wilson, ed. A New Imperial History (Cambridge: Cambridge University Press, 2004), 29-47. Rogers, Press, 69-71, 85, 96-97. Adam Smith, Wealth of Nations, Book 1, Chapter 10. Thomas Clarkson, “The Substance of the Evidence of Sundry Persons on the Slave Trade,” in The British Transatlantic Slave Trade, Vol. 3: The Abolitionist Struggle: Opponents of the Slave Trade, ed. John Oldfield (London: Pickering and Chatto, 2003), 222. Brunsman, Evil, 179; also 202. Daniel James Ennis, Enter the Press-Gang: Naval Impressment in Eighteenth-Century British Literature (London: Associated University Presses, 2002). London Magazine (June 1750), 267; Gentleman’s Magazine (November 1770), 525, 527.